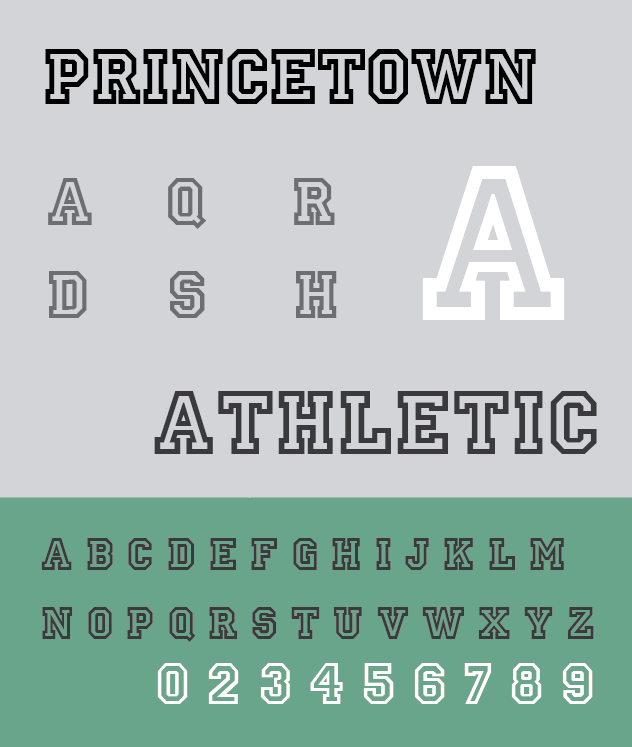 Display typestyles are used specifically for short, bold statements such as titles and headlines. They usually present conspicuous design traits to attract a reader and form a stylistic impression or an identity for the statement. 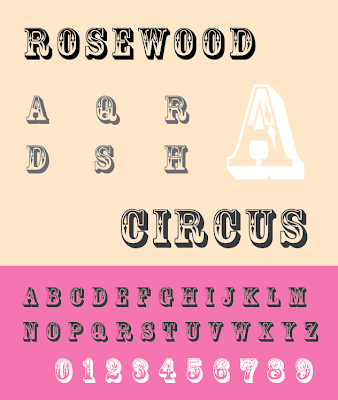 Due to their eccentricity, display typefaces are difficult to read in situations calling for more than eight to twelve words. 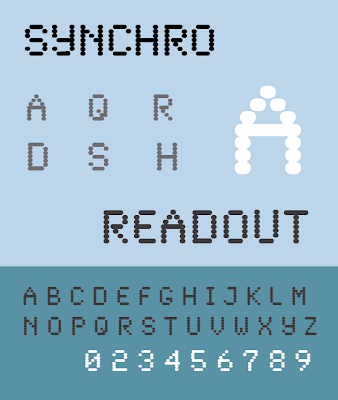 Many styles can be quite illegible in text form. 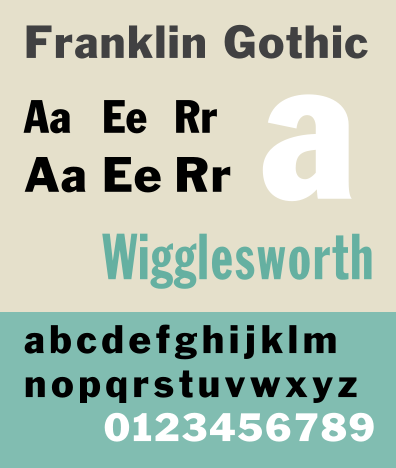 The original development of display type parallels the adoption of sans-serif typestyles, which date from the early 19th century, and have been in constant production to the present. 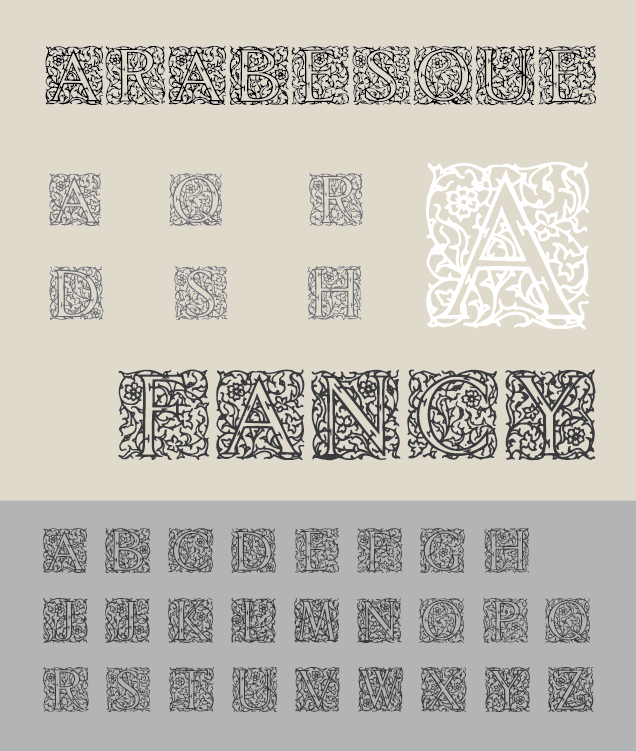 The letterform configurations include every classification of proportioning and ornamentation in existence and many that defy all established conventions as well. 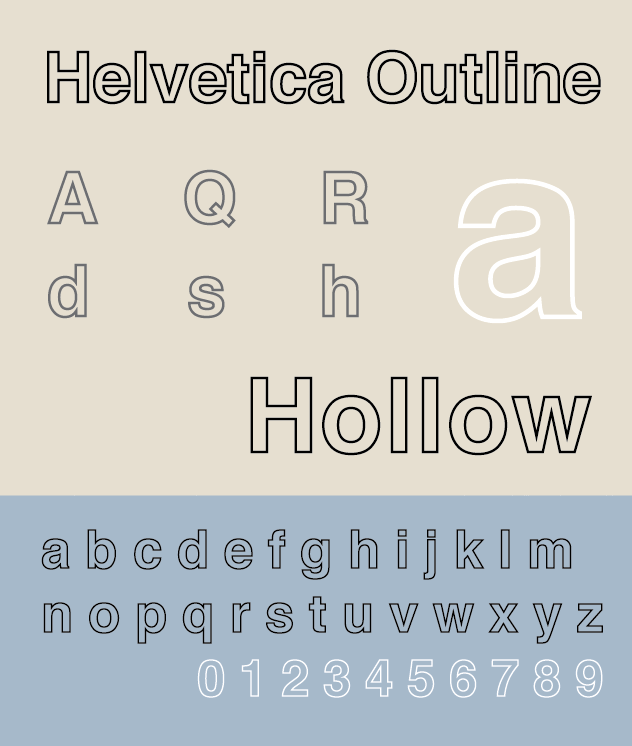 It should also be noted that Serif, Sans Serif, Script, and Gothic text styles can, and often are, used at larger sizes for display type purposes. Layout courtesy of Wikimedia Commons. Modified types are adaptations of established fonts that are used for very special design purposes as well as uses such as single letters, single words, or very short titles. 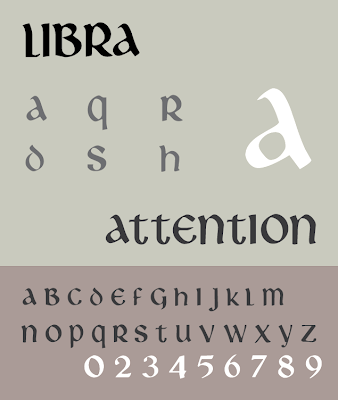 As in display type, the origins of Modified types were primarily in the 19th century, however there are examples of the inline and outline types appearing in medieval manuscripts. 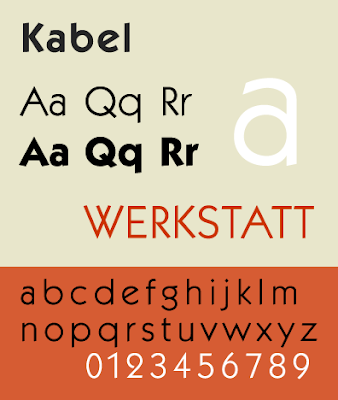 The proportioning and general appearance usually conforms to the type family the specialty type is adapted from. In today’s vernacular Modified type can be referred to as derivative type. 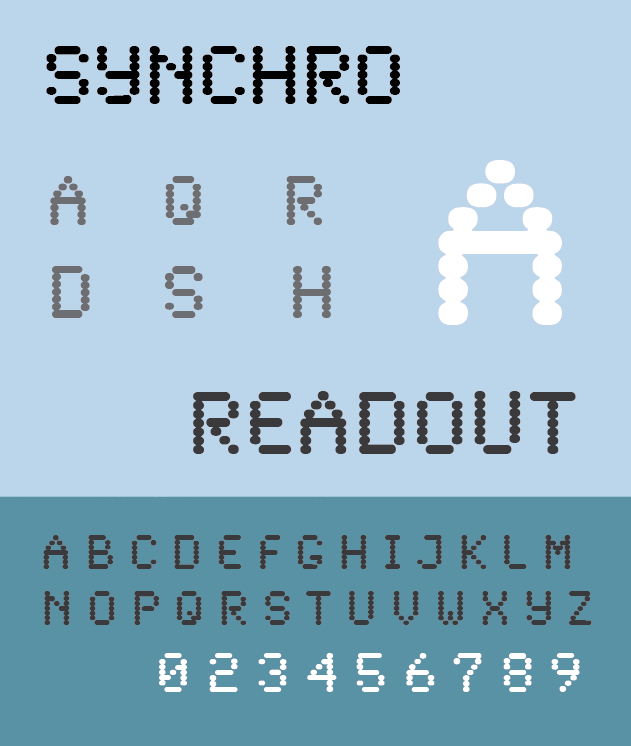 Modified type is available as resident fonts in software and downloadable true type fonts. 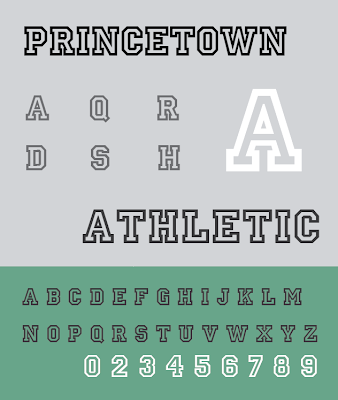 It can also be created on the fly by applying effects and alterations to existing fonts. 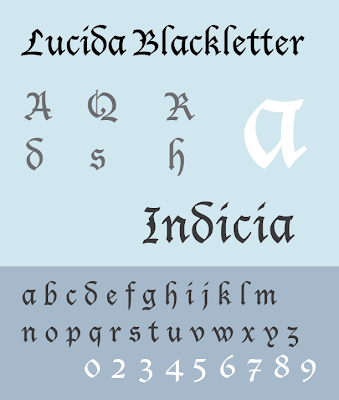 True Gothic style alphabets were the first style of letterforms adapted as moveable type fonts in Western Europe. Primarily beginning in Germany in the 15th century, the stylistic origins of Gothic movable types date back to 12th century ecclesiastic writing. 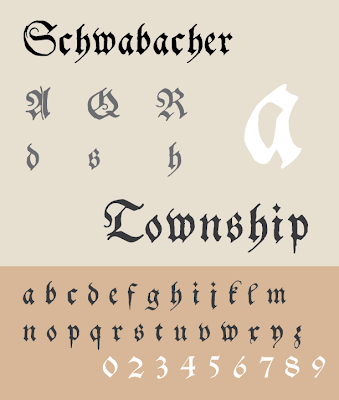 Gothic typestyles can be described as block style calligraphic letterforms fashioned as the direct translation of German manuscript style. Johannes Gutenberg is credited with fashioned the first western movable type font, which contained over 300 characters, far more than are in the fonts of today. 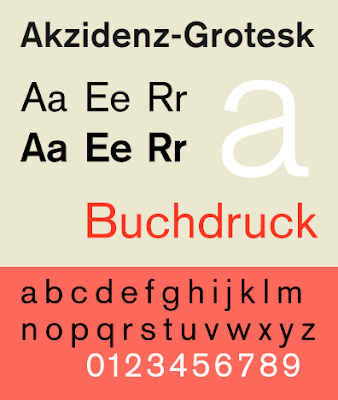 From Gutenberg, Gothic types developed regionally. 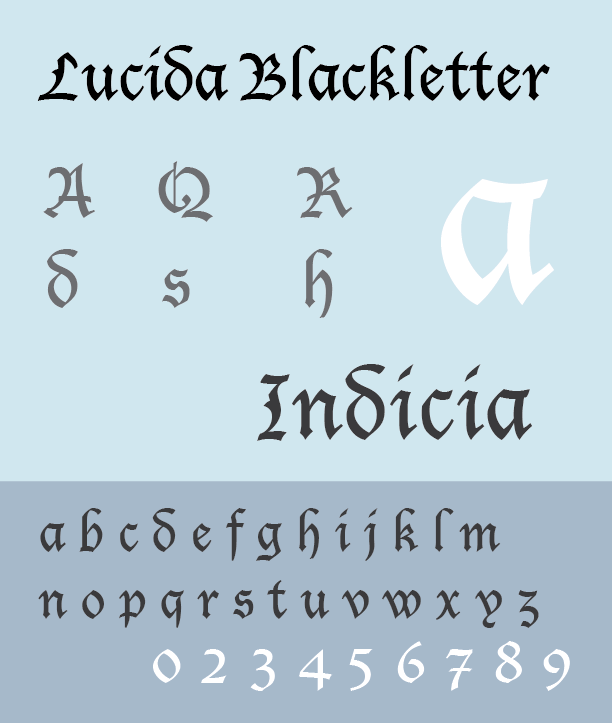 In England, Gothic types were employed later when a alteration of the regional penmanship of the 16th and 17th centuries was adopted for printing. Gothic letters also referred to as Blackletters have thick and thin strokes with an attempt at optically even proportioning. There is also a crude form of serif created by additional marks at the ends of vertical strokes. 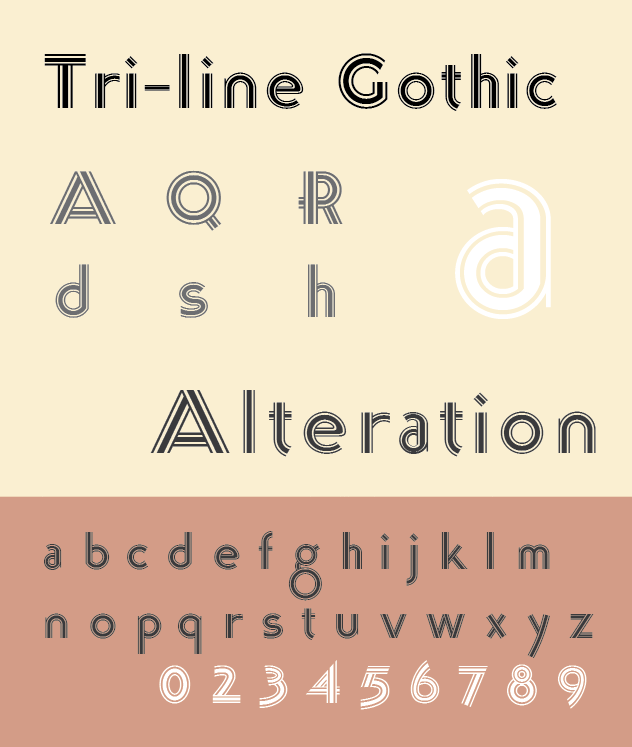 A parallel between Gothic letter styles and Gothic architecture can be seen in the heavy, decidedly dark, tone of letterform structures and the thick stone construction used in buildings of the same period, which influenced them. 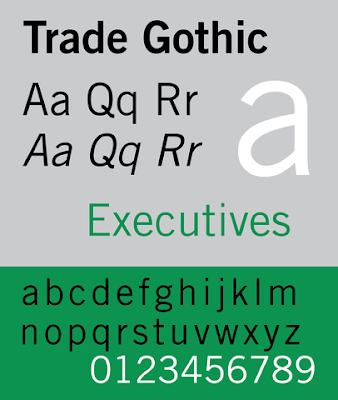 Gothic types are still in use today, but mainly as ornamental display faces. 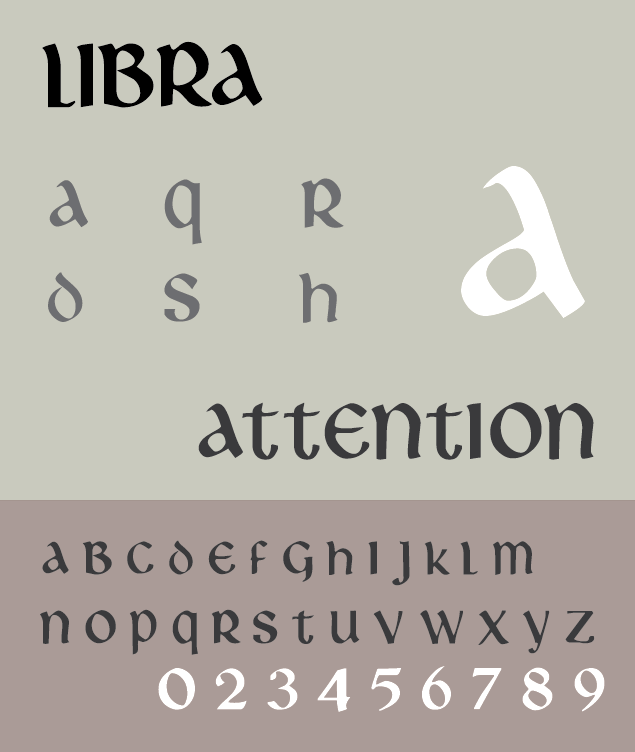 Appearing between the last quarter of the 15th and the beginning of the 16th centuries, Antiqua types comprise a group of types that mimic the hand style calligraphy of miniscule and later styles, but are also structurally modeled after Roman style capital letters. Also referred to as Venetian types, Antiqua types are less ornate than other forms of Gothic styles. 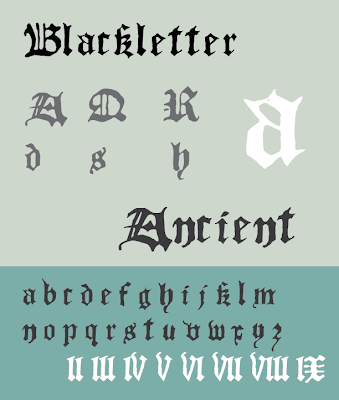 Antiqua was the predominant Gothic style in the 15th and 16th centuries in European countries with the exception of Germany, where both Antiqua and Fraktur (see below) were used concurrently. Format courtesy of Wikimedia Commons. The term Fraktur, which has the same origin as the English term Fracture, means broken. This is a both a structural and a stylistic distinction of Fraktur types, which sometimes display a physical separation between the strokes within a letterform. 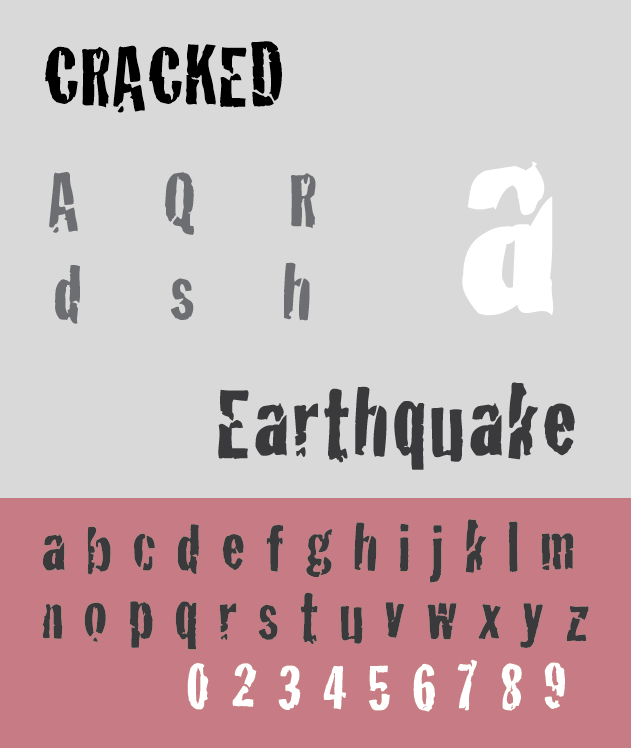 An example of this trait can be seen in the capital F where the top cross stroke can be separated from the downward vertical stroke. 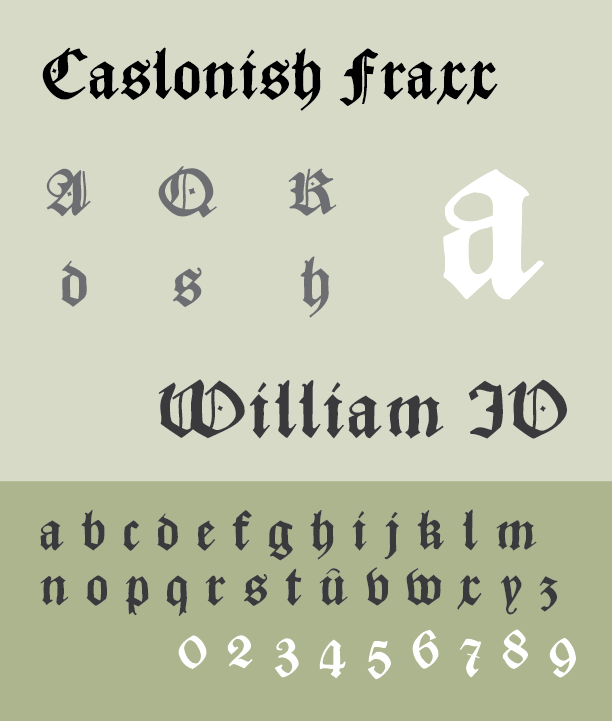 Another characteristic of Fraktur types is their sharp angles and severe directional changes within letter strokes. 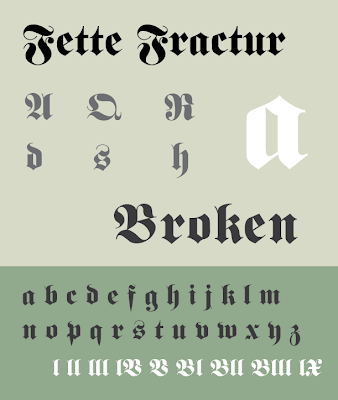 Fraktur is a regional black letter style first popularized in Germany. 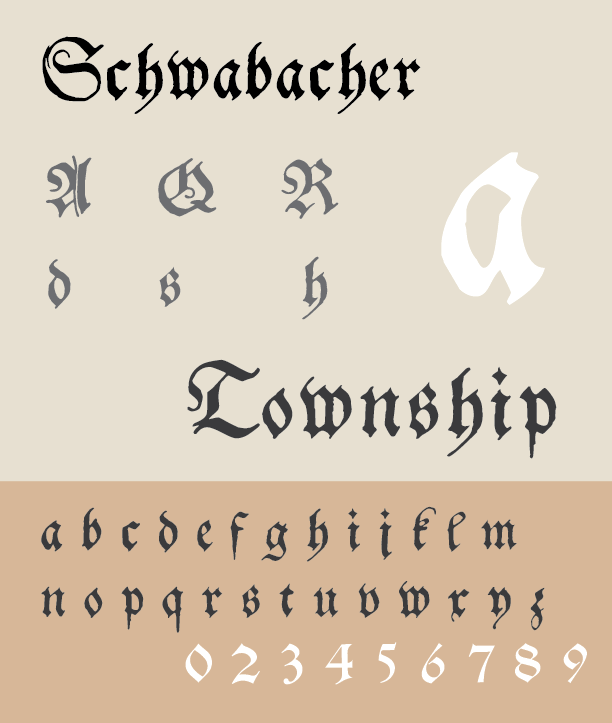 To dramatize how localized the development of Gothic style types was, an even more localized interpretation of Fraktur called Schwabacher originated in the town of Schwabach. There is some debate as to whether Old English types are descended from the written form of Old English or Anglo-Saxon language. 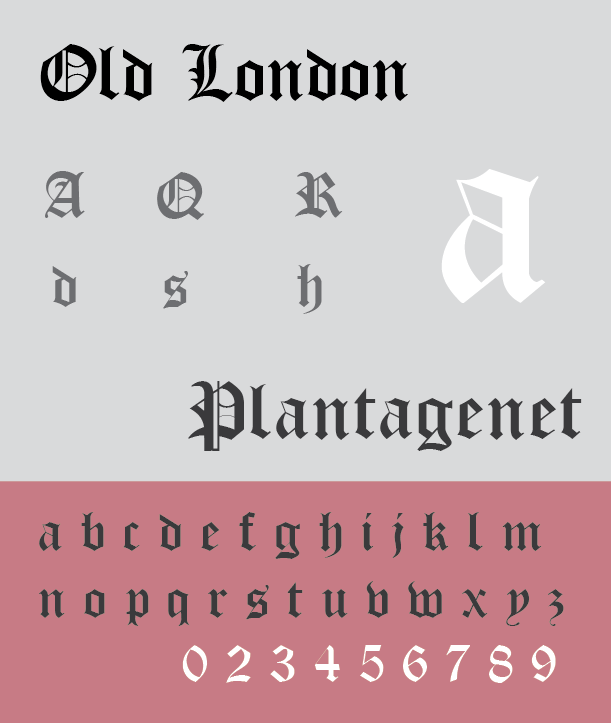 One school of thought maintains that the Blackletter style of Old English wasn’t penned until several centuries later. 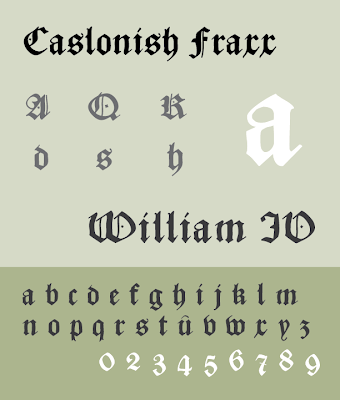 The other asserts that Old English displays traits in lowercase letters that can be seen in Miniscule script writing. 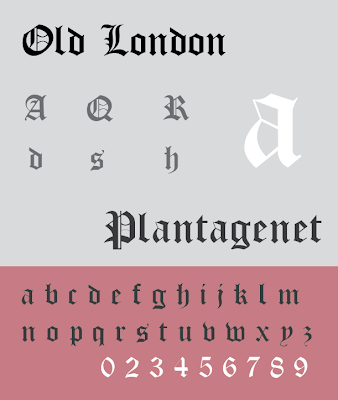 Old English types were England’s regional adaptation of earlier Blackletter styles, which became most prominently used in the 16th and 17th centuries. 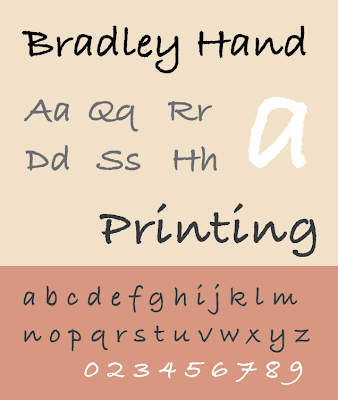 Script types are translations of handwriting styles for the typesetting process. Typestyles that have handcrafted characteristics are also included in this classification. Movable type scripts were a natural extension of medieval and gothic calligraphic alphabet form and technique. 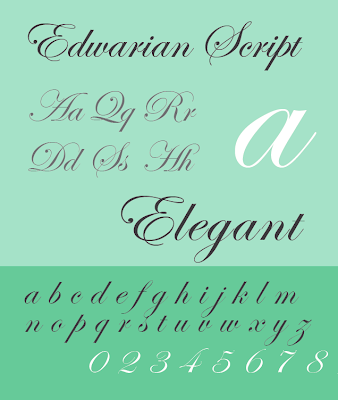 The characteristics that make up many of the script typestyles are almost as varied and personal as individual handwriting styles themselves. Some types are faithful interpretations of formal handwriting and calligraphic style, while others represent an informal side to handwriting and handcrafting letters. 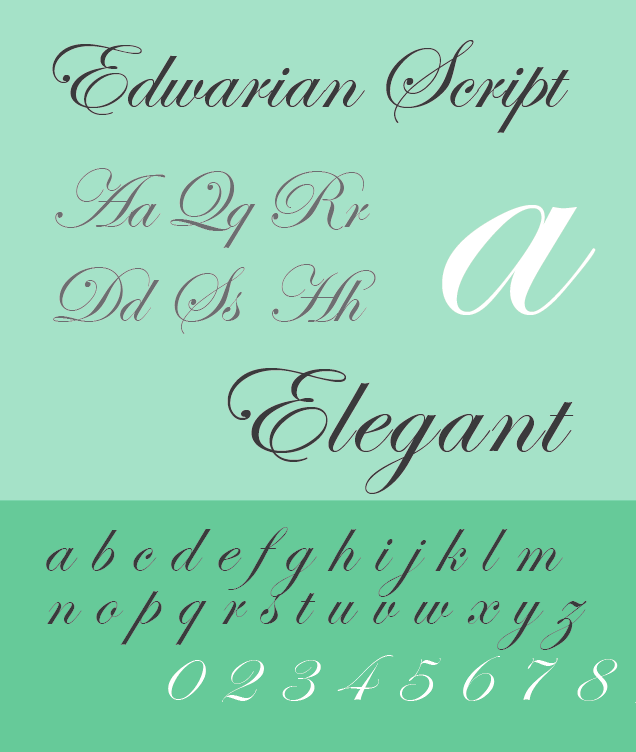 Script styles can be rather simple, or refined and elegant, or quite ornate, or brash and intuitive, or even very expressive. 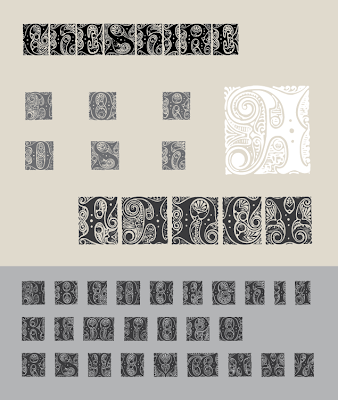 Movable type Script fonts began to be used in the mid 15th century and have proceeded to the present day. 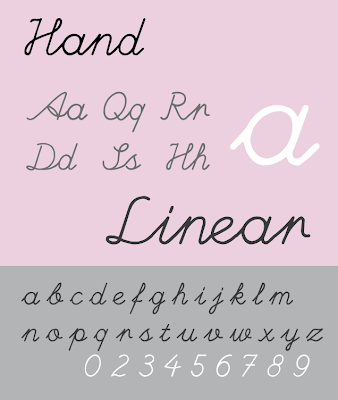 Cursive is somewhat of a catchall phrase that is used for both Italic types and Script. It is derived from a style of penmanship where letters within a word are joined one to another. Although connected writing had been around before the 18th century, it was then that the term Cursive was invented. This writing style is also referred to as Joined-Up writing. As it is difficult for movable types to appear as they are joined, the creation of Cursive functioning fonts presented quite a challenge to type designers and producers. 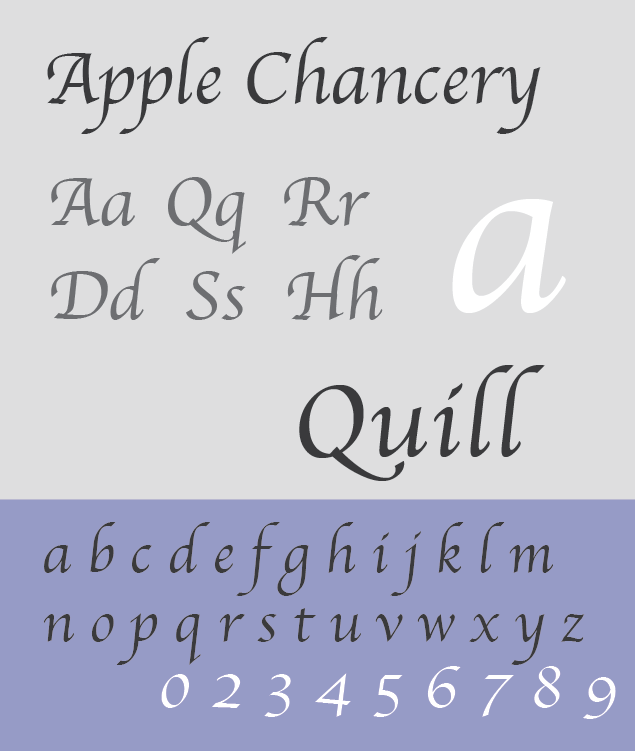 It is the Vatican that can be credited with the development of the Chancery hand style of writing as the name suggests. 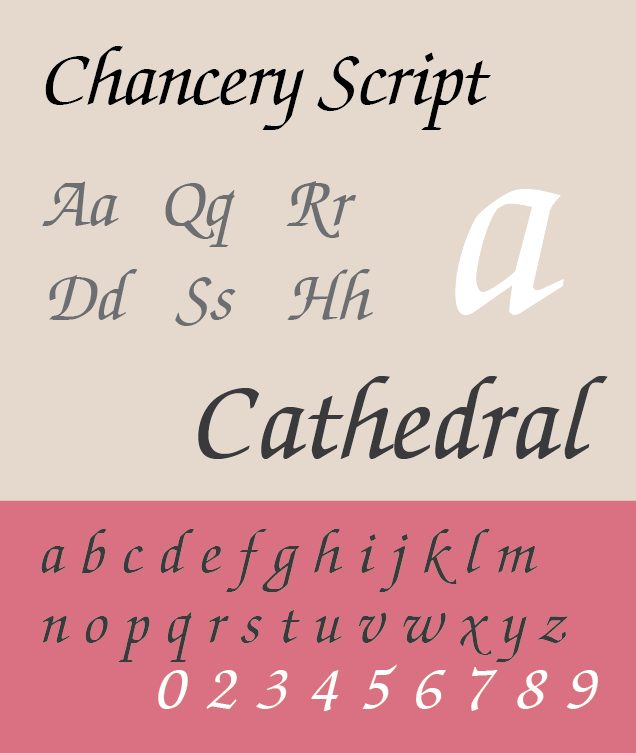 Chancery Script shares the same origin as the Aldine Serif Italic type being based on Humanist Miniscule writing. However, Chancery retains the pure form of a handwritten type, whereas the Aldine Italic blends in ancient Roman styled letterform structure. 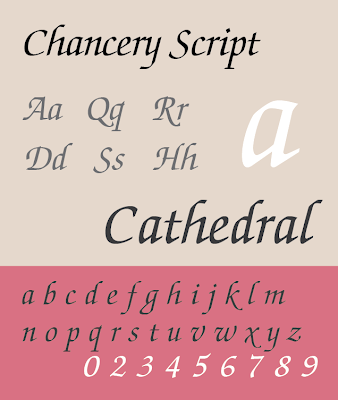 The original lower case letterforms, Miniscule is a Script style that was developed by Alcuin of York during the reign of the Emperor Charlemagne. It was invented to satisfy Charlemagne's devotion to improving literacy across all the regions within his sovereignty. It was widely used from the late 8th to the 13th century. 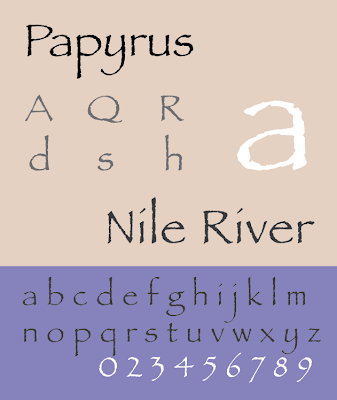 Miniscule letterforms were a simplified, easily legible, and quickly drawn adaptation of Roman Serif style type forms. Prior to Miniscule styles words were only composed using capital letters. 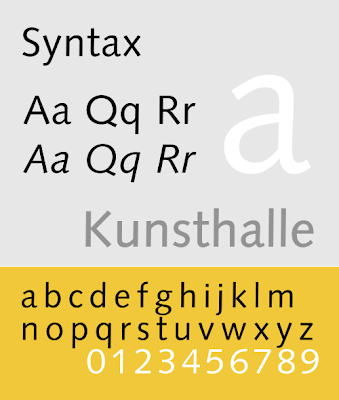 Scripts that are known as Uncials are also classified as a Miniscule style. Initiated by handwriting masters John Ayers and William Banson in the mid 16th century, Roundhand is a style of calligraphy produced with the use of finely crafted divided quills or split metal point pen nibs. 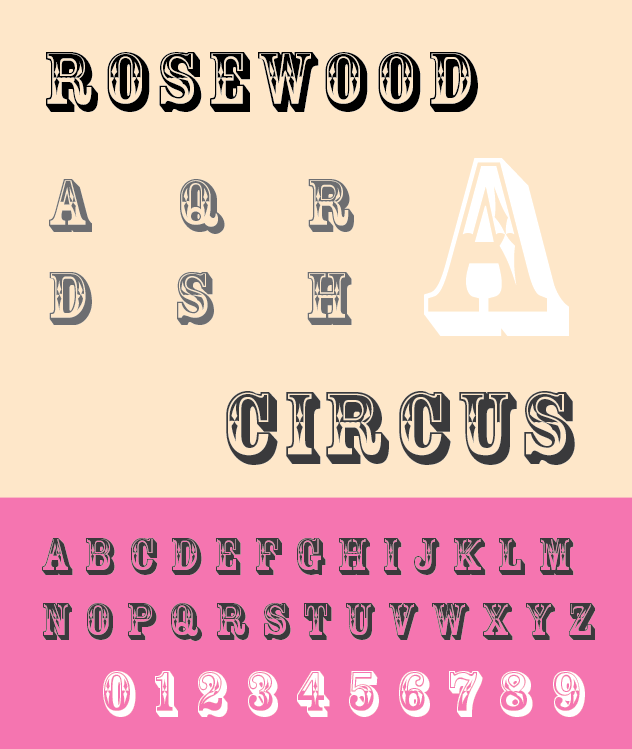 It’s extreme elegance of form and refined relationship of thick and thin strokes brought instant popularity to the style, which was later adapted to movable type fonts. 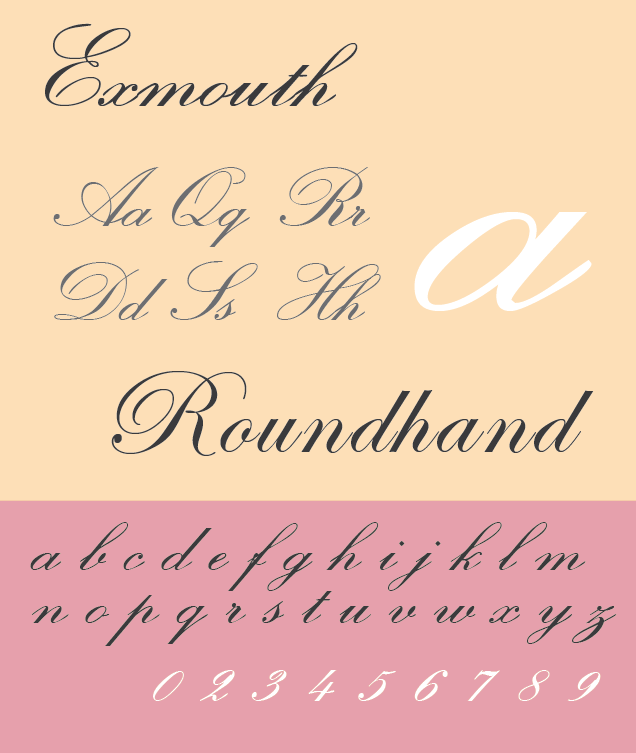 By the middle of the 18th century, Roundhand was the most popular form of writing in Europe largely due to the publication of The Universal Penman, a book displaying sample penmanship written by George Bickham the Elder. 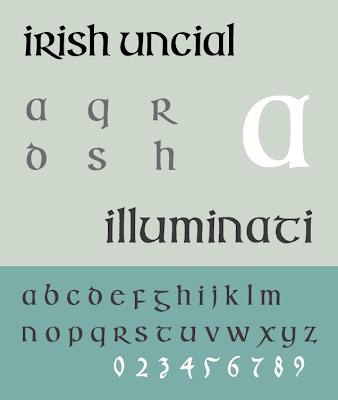 Illuminated types are simplified descendants from illuminated letterforms in medieval manuscripts such as The Book of Kells. 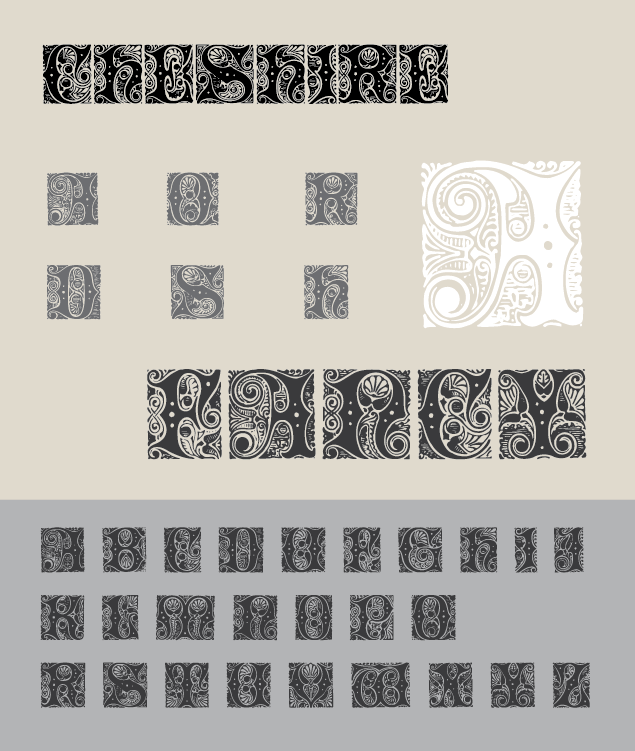 These highly ornate interpretations of letterforms are used sparingly, usually as an initial or single word for special applications requiring emphasis and imagery. Originally only appearing as hand-illustrated letters, Illuminated initials have been cut into wood and metal for movable type printing applications. Cheshire. Format courtesy of Wikimedia Commons. Arabesque. Format courtesy of Wikimedia Commons. Handstyle as a term has been around for hundreds of years and is used to classify a form of Cursive that is particularly individual and personalized. It can be described as a kind of signature or non-formalized kind of writing. 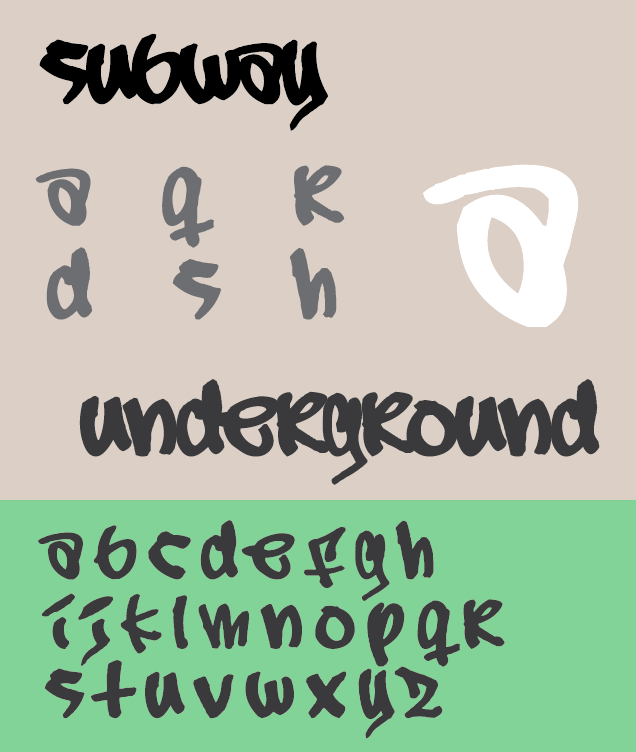 Presently, Handstyle has become part of graffiti jargon as a term to describe tag lettering. 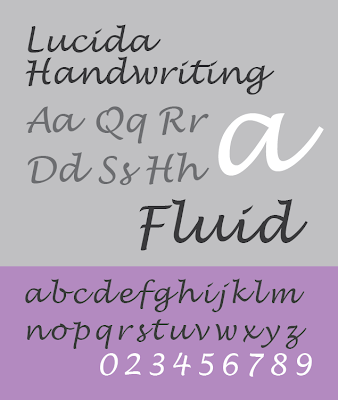 This form of Script style is fast being developed and becoming available for current type setting applications. 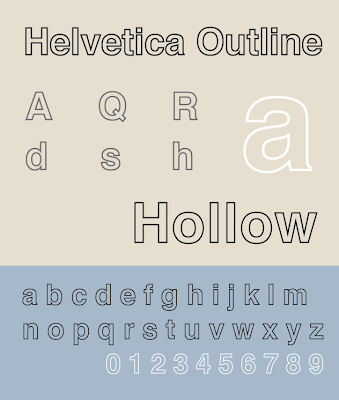 Developed long after the establishment of Serif types, Sans Serif styles constitute a large number of fonts available for a variety of both text and display applications. 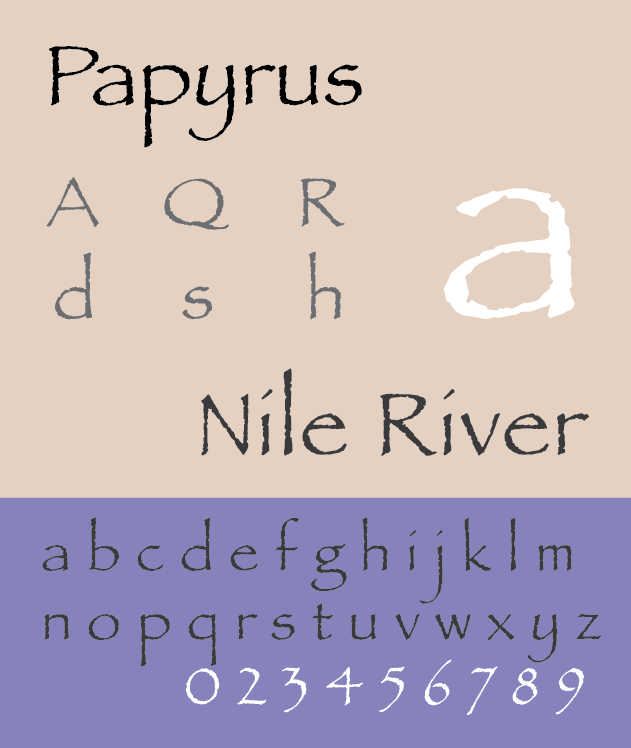 Speaking chronologically, there is evidence of the first uses of movable type Sans Serif words and letters occurring in the latter half of the 18th century, however, the first complete type specimen is attributed to William Caslon IV who produced Caslon Egyptian in 1816. 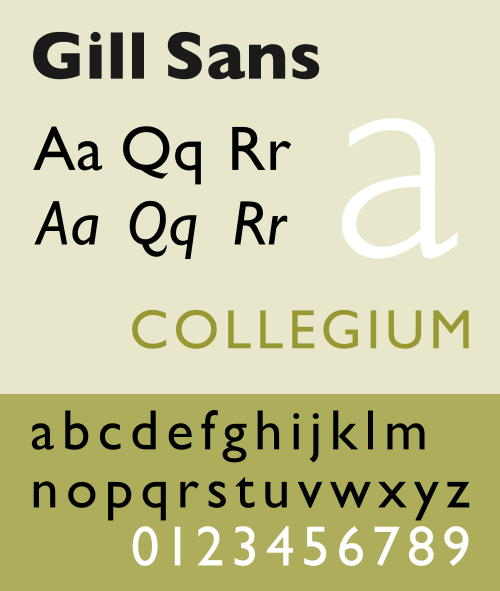 Quite coincidentally, the popularity of Sans Serif types parallels the development and use of Slab-Serif fonts. Both styles were thought to be well adapted to printed materials produced for public displays owing to the boldness of the original designs. Sans Serif letterforms are easily distinguished by their clean simple rectangular ending of strokes. 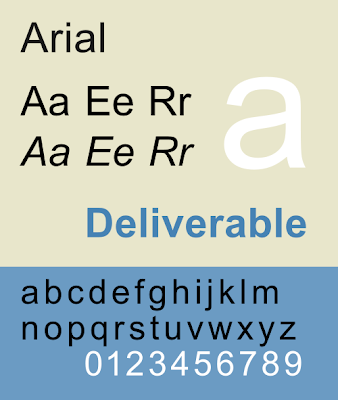 There are two possible directions that can be taken when referring to the classification of Sans Serif types, the first being a historical approach, and the second being a stylistic one. 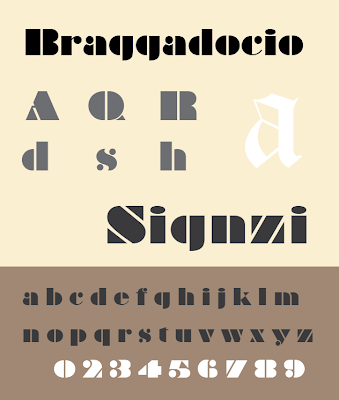 The historical approach would include categories such as Grotesque, Neo-Grotesque, Black Letter, etc. 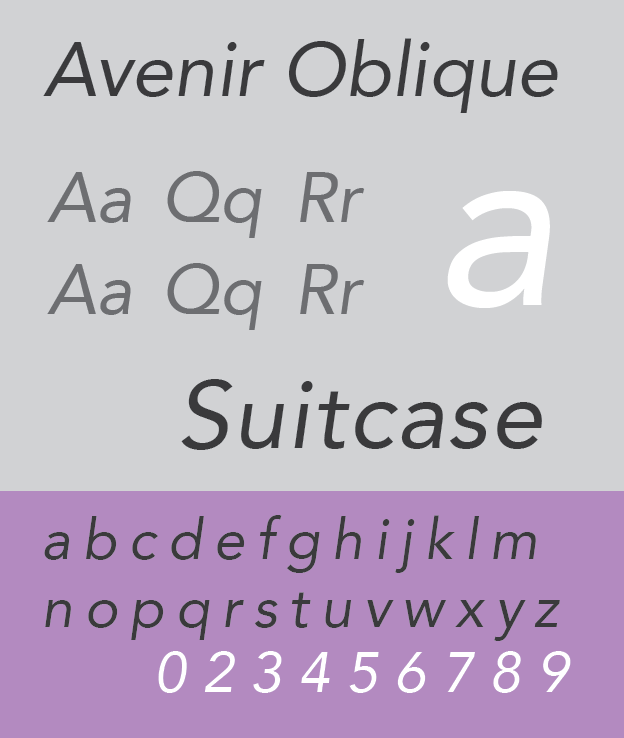 A stylistic classifications of Sans Serif typestyles includes Classical, also called Humanist, Old Style, or Egyptian; Modern also called Transitional, Realist, Universal, or Utilitarian; Grotesque or Grotesk, also called Gothic; Geometric also called Super-Shape; and Italic also called Slanted or Oblique. 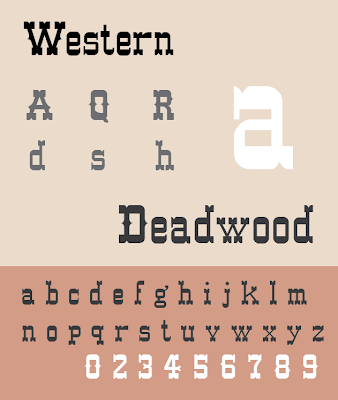 The following takes is based on a stylistic approach to categorizing Sans Serif types. 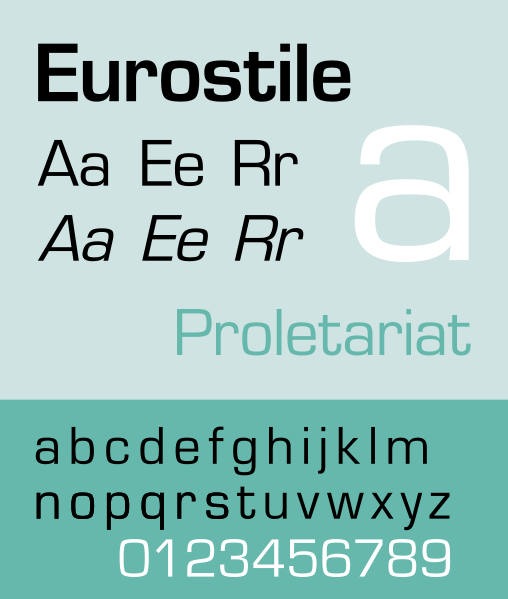 When Sans Serifs styles first appeared, type critics and historians considered them to be unrefined and ugly, thus christening them with the descriptive term “Grotesk” or “Grotesque”. The term came from an association caused by the comparison of the then newly introduced Sans Serif types to the very elegant Modern serif types that were introduced only 20 years prior. Another term that was coined by type scholars of the early 19th century and crept into the descriptive vernacular of Sans Serif types was “Black” or “Black Letter”. 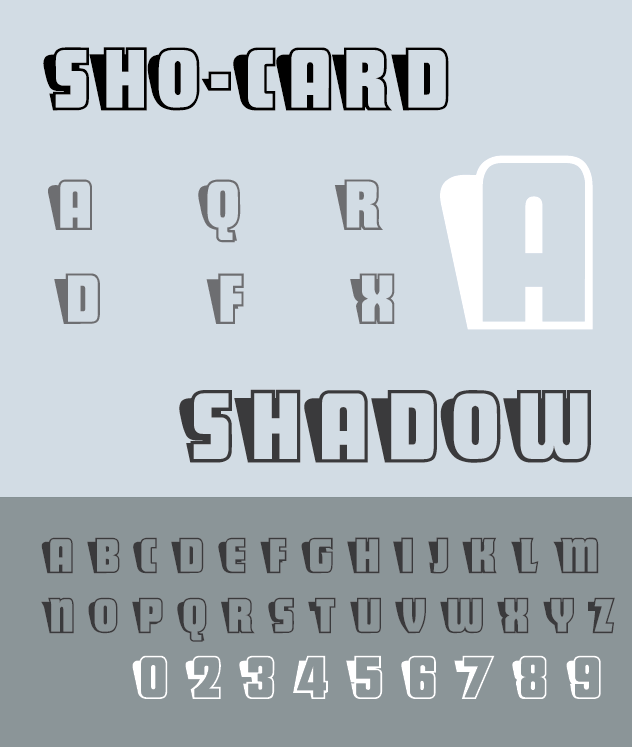 The name was inspired by the heavy dark appearance of letters and a lack of contrast between horizontal and vertical letter strokes. Sans Serif movable types of the 1800’s represented a kind of letterform design that essentially established a whole new form for letterform strokes. Their introduction was controversial and difficult to classify for type critics and scholars. 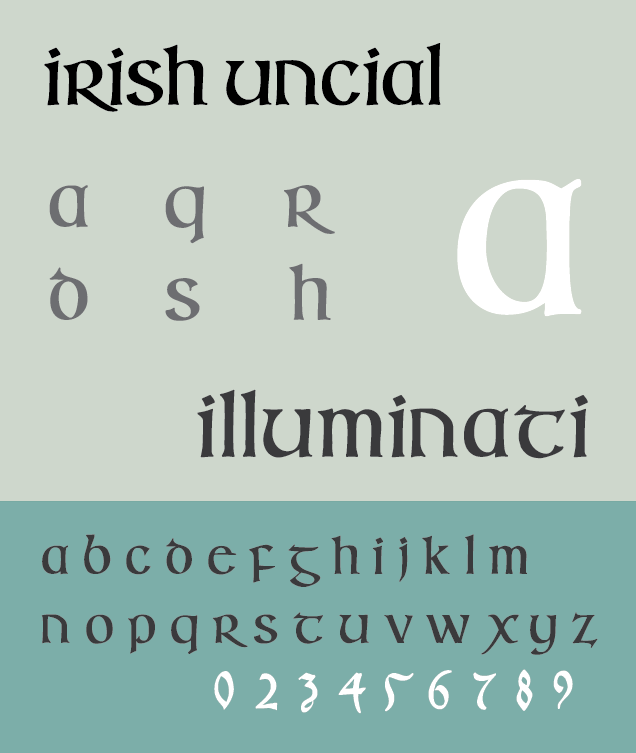 To deal with this problem many looked back in history at prior styles of letterforms to help with the classification of these new types. They saw a similarity to the thick bold structures that were inherent in Gothic types, so another label they came up with for Sans Serif types was “Gothic”. Like Old Style Serif types, Humanist Sans Serif letterforms display many of the same characteristics. One way to identify Humanist San Serif types is by letterform proportions that reflect those of ancient Roman letters that were based on the Golden Section. 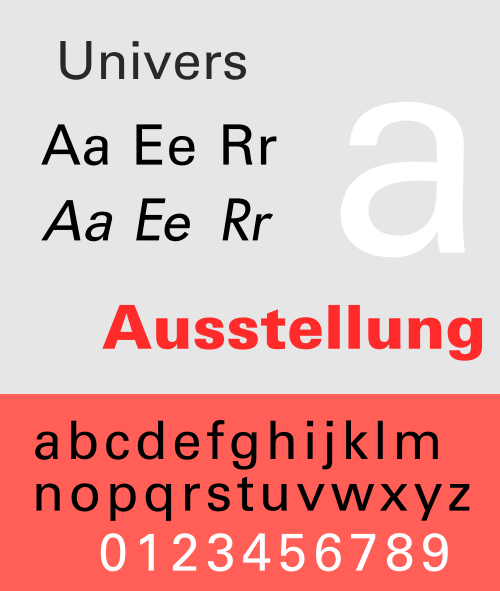 This variety of Humanist styles are made up of letterforms that vary in width, with letters B, E, F, J, L, P, and S having a strong vertical 2:1 height to width ratio emphasis; while A, D, H, K, N, R, T, U, V, X, Y, and Z are closer to a 9:8 nearly square ratio; round letter such as C, G, O, and Q are based on a 1:1 ratio circle; and the width of letters M and W extend beyond the height ratio to a 9:10 ratio. Humanist types may also exhibit one or more of the following traits; a calligraphic appearance to letters; lowercase letterforms with a smaller waist or x-height in comparison to cap-height; and letterforms that display a marked contrast between thick and thin strokes. Examples of Humanist Sans Serif fonts include Calibri, Gill Sans, Frutiger, Lucida Sans, Myriad, Optima, Syntax, and Verdana. Soon after William Caslon IV’s Caslon Egyptian type, Grotesque types came into popularity and are still in usage. 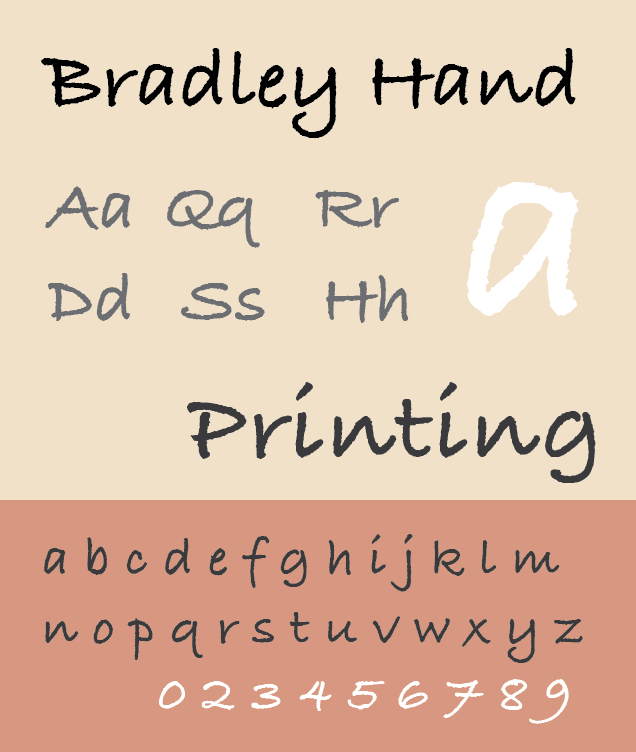 These types differ from Humanist style types in that they do not display calligraphically influenced letter strokes, but instead are made up of strokes more reminiscent of Modern Sans Serif types. Appearing to be somewhat primitive versions of Modern types, none-the-less, some Grotesque types display minor script-inspired Humanist traits. 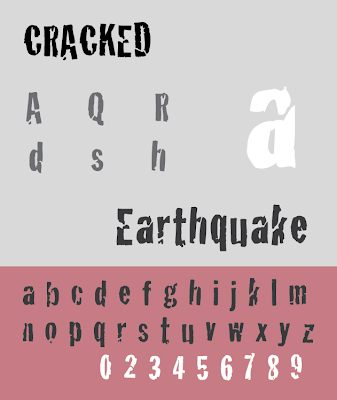 Grotesque types are constructed with even-width horizontal and vertical strokes; have some angled vertical stroke ends, as on the lower-case t and s; and stroke extensions that occur on some letterforms such as the upper-case G and the lower-case a and y. Examples of Grotesque types include, Akidenz-Grotesk, Franklin Gothic, News Gothic, Standard, and Trade Gothic. Grotesque. Courtesy of Wikimedia Commons. Gothic. Courtesy of Wikimedia Commons. 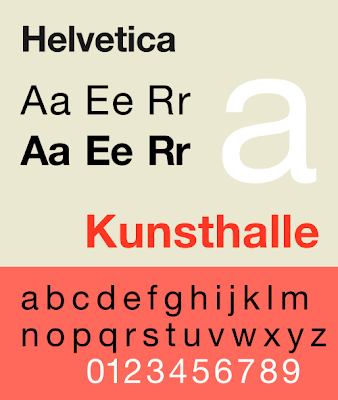 Modern Sans Serif text types differ from Humanist styles in several respects. They are based on Modern letterform proportioning, which relies on a common optical width on to base all the alphabet letters. 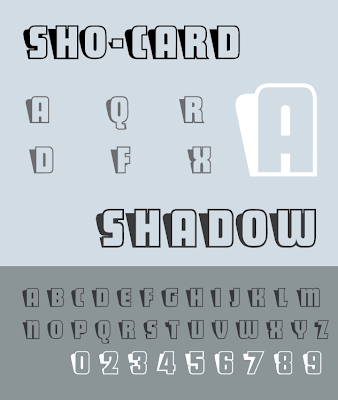 To achieve an even width appearance, Modern proportioned letterforms contain subtle width variations to compensate for optical deceptions. This is done with the intention of having all the letters to look as though they are the same width. 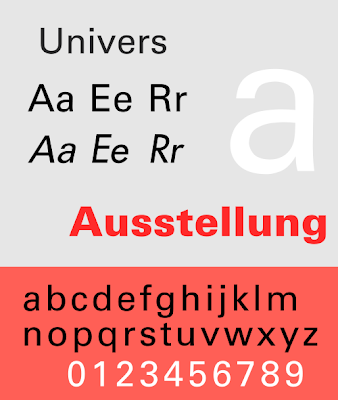 The utilitarian design of Modern San Serif types has contributed to their universal appeal for applications that require fonts to be highly visible and legible. 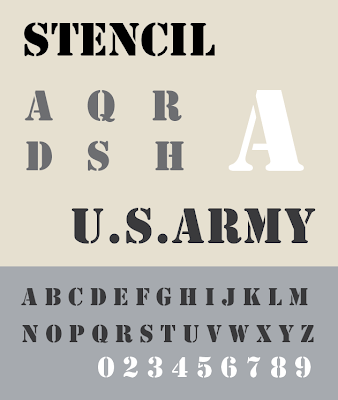 In addition to optical proportioning, Modern Sans Serif letterforms have little contrast between thick and thin strokes; lowercase letterforms with a taller waist relationship to cap-height; a simple utilitarian appearance; larger more open counters; and well defined negative spaces. Modern. Courtesy of Wikimedia Commons. 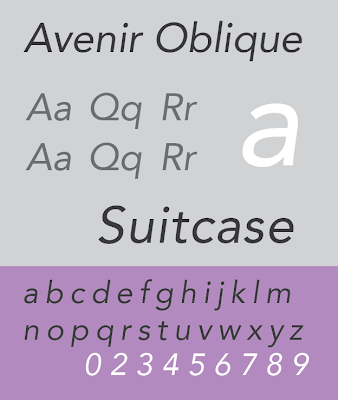 Typestyles that fall into this category of Sans Serif classification are structurally tied to regimented geometric shapes. This requires some sacrifice of functionality when readability and legibility are considered. 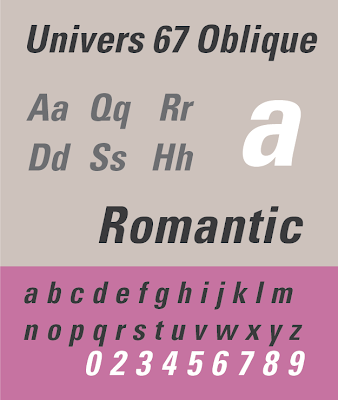 Geometric types place regularity of form and aesthetic above usability and function. For this reason Geometric types are better suited for titling or display purposes and are seldom used for paragraphs of text. Geometric fonts integrate particularly well when embedded into other forms of graphical symbols and imagery. Many letterforms in Geometric fonts share a common structure, which is based on a standard geometric shape or a customized shape, so different letters may appear to be based on a common shape and display the same width; round letters like C, G, O, and Q share a common structure, and other letters such as D, E, F, L, S, and U may also be based on that same structure. 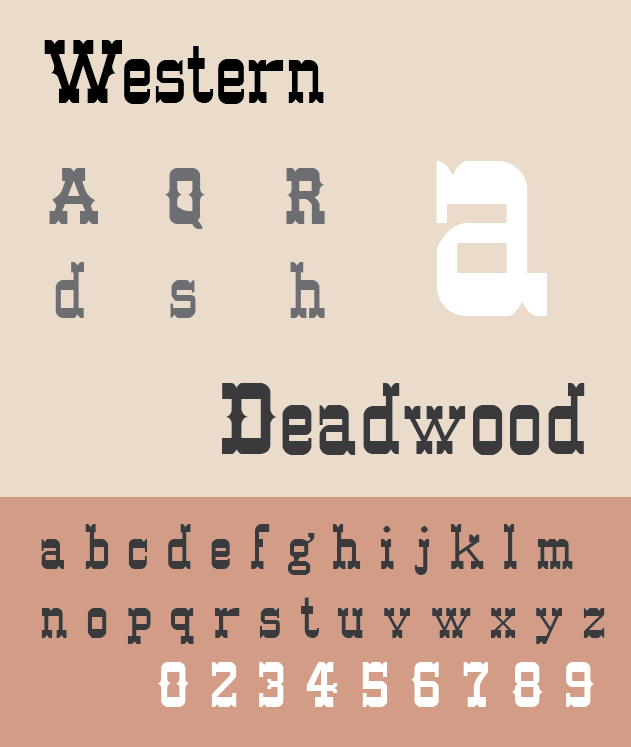 Some Geometric fonts may be comprised exclusively of upper-case letters, while others contain both upper and lower-case. 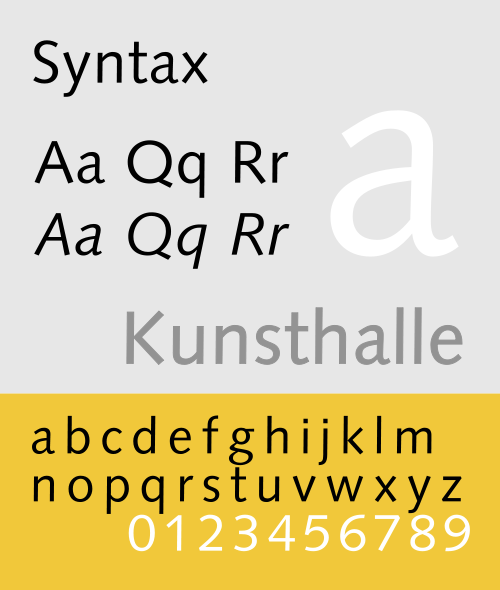 Examples of Geometric Sans Serif fonts include Avant Garde, Eurostyle, Futura, Handel, Kabel, and Spartan. Geometric. Courtesy of Wikimedia Commons. 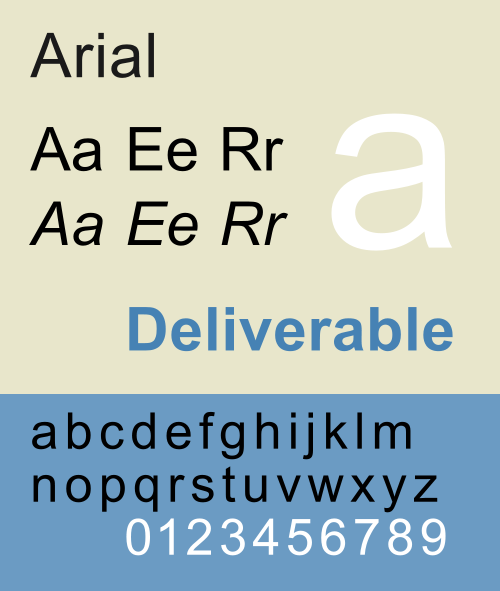 Unlike Italic Serif text types, which in many cases were developed as stand-alone fonts, Italic Sans Serif text types were usually the result of adapting a non-italic version of a typestyle to an italic slant. 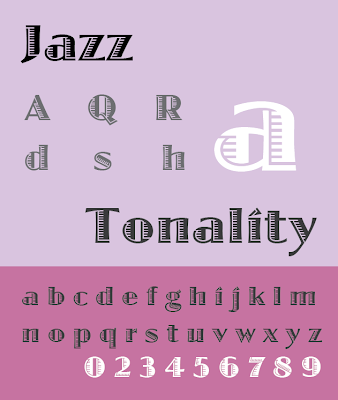 This was done to add flexibility to font styles for use in more complex hierarchical typographic arrangements. 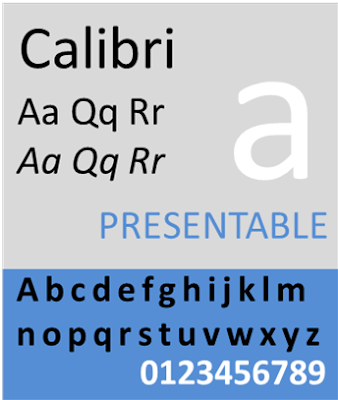 Sans Serif types that were developed for specialized display purposes only have been developed as stand-alone fonts with no non-italic version. The main characteristic of Italic Sans Serif types is their slanted appearance. 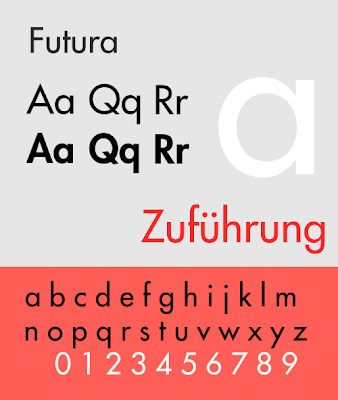 They are accurate representations of their original non-italic structure. 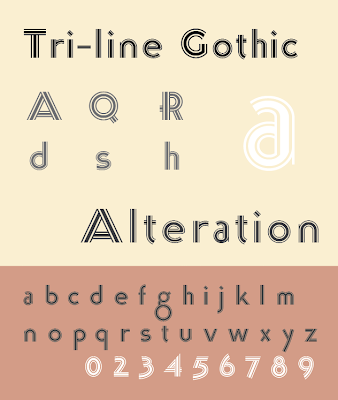 Other stylistic traits of Italic types include a slight condensing of letterforms for efficient use of space. 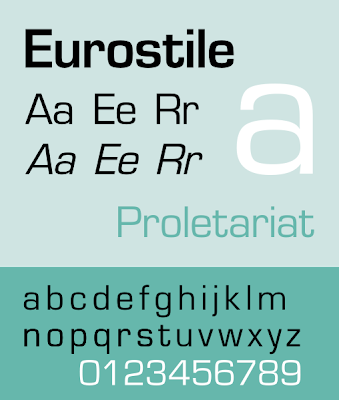 Sans Serif types are available in Humanist, Grotesque, Modern, and Geometric styles. 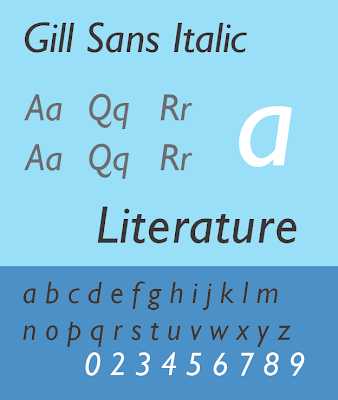 There is a difference between an italic version of a Sans Serif font and an italicized or oblique version. 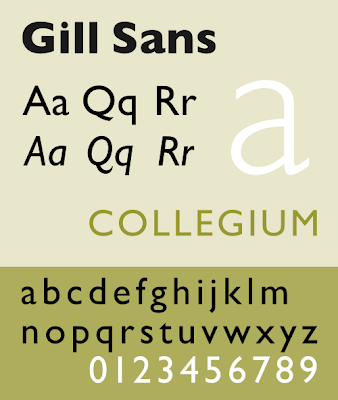 In the sample of Gill Sans Italic below, the lower case a is a cursive style letter. 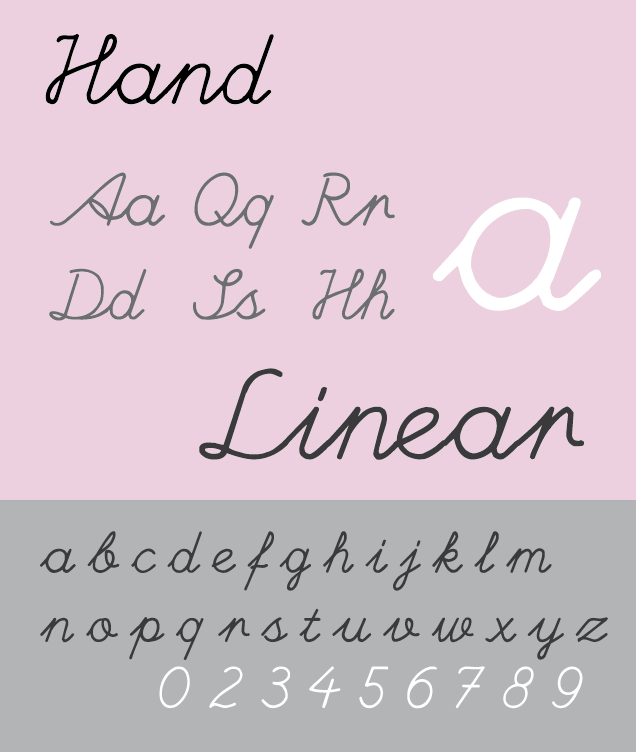 Italic styles display an influence from hand written style while oblique fonts will display a slanted non cursive version of their regular counterparts as is evident in the Avenir Oblique sample below. 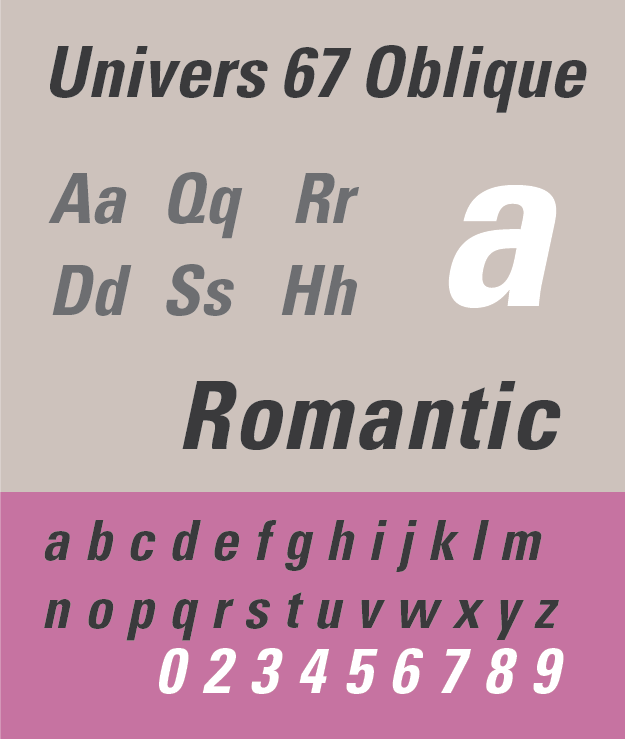 There are many examples of Italic and Oblique Sans Serif fonts including Avenir Oblique, Franklin Gothic Italic, Futura Italic, Gill Sans Italic, Helvetica Italic, and Univers 67 Oblique. Oblique. Layout courtesy of Wikimedia Commons. 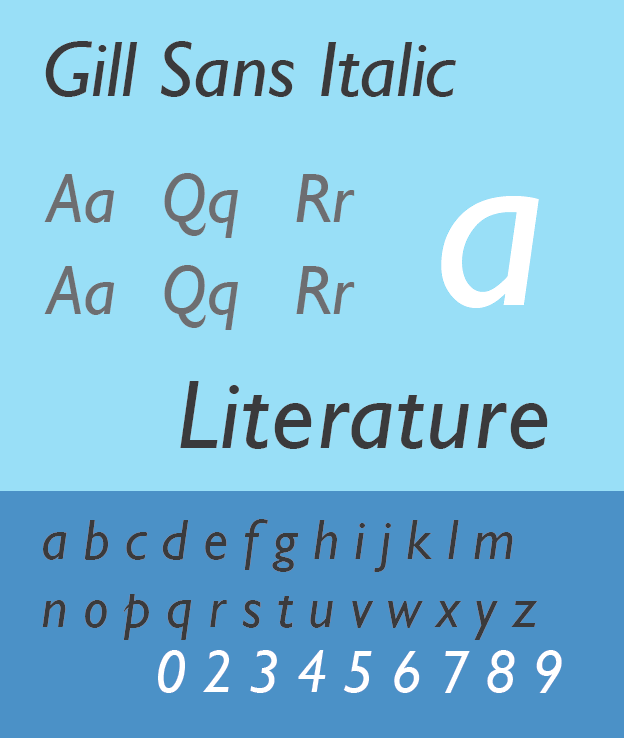 Italic. Layout courtesy of Wikimedia Commons. Disclaimer: The original versions of fonts that were designed as either hot metal movable type or film based type may be different from the digitally formatted types that are in common use today. 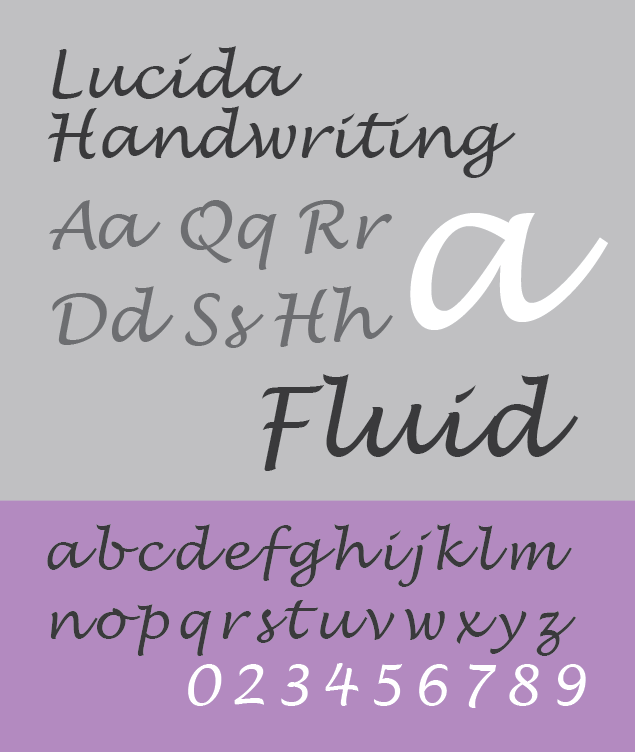 In many cases these fonts have been redrawn and adapted to digital technology.